Belmont House is located in the National Heritage City of Bath and offers 7 guest rooms Two twin rooms with private bathroom, 2nd floor, three double rooms with private bathrooms on various floors and two standard double rooms with shared bathroom on 3rd floor. The house is over two hundred years old and has been recently refurbished. Whilst we aim to meet the needs of all our guests there are some period features of the house which might make access difficult for people with limited mobility. 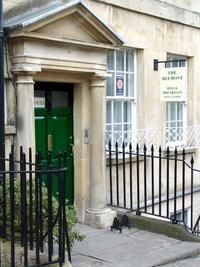 We are located within a 5 minute walk to Bath City centre and the main tourist attractions. You can plan your journey by car or public transport using www.transportdirect.info. Simply enter your post code and ours, which is BA1 5DZ to get directions. The nearest shops are approximately 200m away. The nearest bus stops are just outside the property. Bath railway station is approximately 15 minutes walk. Taxis are usually available at Bath station but we can book one for you in advance if required. Bristol airport is 40 minutes by car. On street parking is available, though this can be expensive. We do have parking permits for 3 blocks up the road on street parking @ £2.00 per day. Access to our property is gained from the flagged sloped pavement up several steps. Entry step of 5 inches (130mm) at the front door which is 40 inches (1 metre) wide, then a walk of 18 feet (5 metres) to reception area and dining room. Our guest rooms are on three floors and are accessed by means of stairs (175mm &7ins). There is a hand rail on one side. All public areas, hall, stairs, and landings are well lit using ceiling lights. The breakfast/dining room is situated off the hallway on the ground floor and the entrance is 900mm (36ins) wide and step free/level entry. Large windows allowing plenty of natural light supplemented by adjustable overhead lights. There is seating for 12 people at separate tables and co-ordinating chairs. There is a co-coordinating oak cabinet and buffet table where guests can help themselves to cereal, fruits, yoghurts and juices. Assistance can be provided on request. There are 'In Case of Fire' instructions posted on the back of the guest room doors. We also have a selection of menus from local restaurants for guests' perusal. Free Broadband and Wi-Fi facilities are also available on the ground & first floor (at the moment). We are happy to try to accommodate special diets and dislikes. Please advise us before your arrival. We can refrigerate prescription medication and additionallystore any perishable food in our fridge for a limited period. Mobile phone reception at No 7 is generally good. Hours Of Operation Flexible within reason.